When a company purchases goods and or services from an out of state company and the selling company doesn't collect sales tax, then use tax could be due to the purchasing company’s state and/or local taxing authority. [i] If the purchase would have been taxed had it been made in their local jurisdiction, then use tax is due. Additional explanation of use tax can be found here. There are several approaches that Equation recommends to track use tax in Sage 300. The first option to track use tax in Sage 300 is to set up a separate tax authority and tax group specifically for use tax. This will allow you to create payable invoices utilizing this tax group. Thus, once the invoices are posted, you can use the standard tax reports to see the purchases made using this tax group. It is important to note in this methodology the tax rate is set to 0.00% so that the invoices payables are entered in the amount that are presented by the vendors. The implication of this is that the tax report will show the amount of the invoice but does not commit the potential tax liability to the financial statements. The benefit of this approach is that vendors from whom you routinely purchase goods and/or services where use tax needs to be tracked, their tax group can be set to your use tax group and then all their transactions will automatically be tracked. The below example is based upon the SAMINC database. Here we create a Tax Authority called USETAX, a single set of Tax Classes, set the Tax Rates to 0% and created a Tax Group also called USETAX. Next, we set a vendor up to always track use tax. When an invoice is generated in AP for this vendor, their tax group now defaults to the use tax group. Similarly, when a purchase order is created, received, and invoiced, it will default to the same tax group. Finally, once the transactions are posted, the Tax Tracking report can be run. 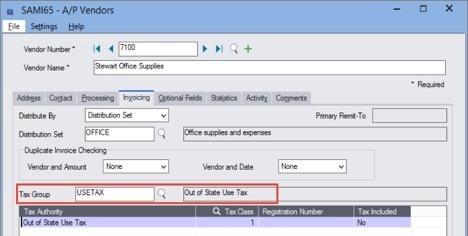 A second methodology for tracking use tax is to use an optional field. In this methodology, an optional field is configured on an AP Invoice Detail line level. If the optional field is also set up at the General Ledger level, then the optional field can flow to the transaction details and custom reports can be created to report back on this information. When the optional field is set at the detail level, then the invoice can be spilt so that one detail line can be tracked for use tax and another is not tracked. Thus, this option works well when you have a limited number of transactions which need to be track and/or you have vendors where only part of their invoice needs to have use tax tracked on it. Configure an optional field in Common Services as a Boolean field (Yes/No), then set the optional field up in AP Set Up. If so desired, the optional field at the detail level can be set to Auto Insert (and appear on all line items) and have its default value set to no. Additionally, the optional field could be set up on the vendor and have the value on the invoice details source from the vendor master setup. 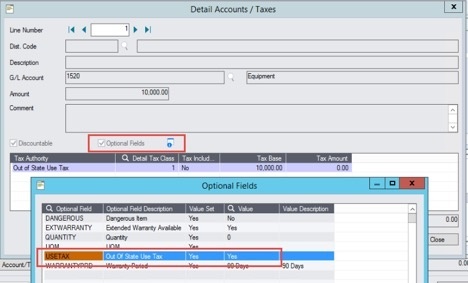 On a specific line item, the use tax field can be set. Once posted, if the optional field is set up in the GL, then you can see the use tax tracking in the GL. There are options for automating sales and use tax processes that are integrated with Sage 300. The automation tools ensure your tax rates and codes are always up to date as well as provides the tools to generate and file accurate and timely returns. For more information on how to automate use tax processes, please contact us. Does this article spark additional questions about your unique situation? Give us a call at 866.436.3530 and one of our experienced consultants would be happy to conduct a business review to help you understand how to best implement use tax tracking. [i] Equation Technologies, Inc. presents this blog post as illustrations of options on how to track use tax within the Sage 300 software and does not provide tax advice on taxation policy. Please consult your trusted tax advisor for specific details on taxation regulations and compliance applicable to your organization.